Picture this: It’s a Monday morning, and you forgot to set your alarm last night. You run around and grab a shower, some breakfast, and your pants before you’re finally ready to head out the door– but you can’t find your keys anywhere. The good news? That’s totally normal. The average American spends six minutes looking for their keys in the morning, and an entire year of their life trying to find misplaced items. The good news? That’s totally normal. The average American spends six minutes looking for their keys in the morning, and an entire year of their life trying to find misplaced items. If you’re ready to end the lost-and-found cycle of your front door keys, it may be time to consider a keyless entry system. To know which one is best for you, it’s important to understand the different types of keyless locks, and which systems are the best in each. One of the sexier door-locking technologies on the market, biometric door locks use your fingerprint to grant you access to your home. Many smartphone users will be familiar with this technology. 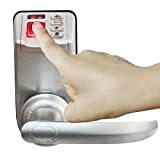 You simply “program” your lock by allowing it to continuously scan your fingerprint, and voila; your door now opens with a single, unique touch. This type of lock is safer than some other types of keyless entry systems for a couple of reasons. For one, a burglar with your cell phone or key fob still won’t be able to get in. You or another guest with a programmed print must be physically present to make the door open. Another plus? It’s impossible to leave your house without your fingerprint. As such, you’ll never spend a second looking for it in the morning. With flashy tech, however, comes a flashy price. Biometric door locks are some of the more expensive keyless entry systems on the market. However, if you’re looking for a high-security system, a biometric door lock might be the right choice. We’ll give you the details you need to know about some of our favourite keyless door looks (keep on reading! ), or just check out our handy comparison chart. It’s not the best looking biometric door lock money can buy, the Adel Keyless Biometric Fingerprint Door Lock Trinity 788 is one of the most reliable. A lot of biometric lock users complain about faulty fingerprint readers that almost never work. This lock’s reviews show the opposite: a reader that works like a charm, every time. In case your fingerprint ever doesn’t work (or you’re wearing gloves) the Adel Trinity 788 comes with a backup keypad entry option. If the battery runs out or the system malfunctions, there’s a manual key option as well. The unit can store up to 99 fingerprints, which is great for big families or households that often have guests. Deleting prints is simple, too, making it a good option for rental homes or Airbnbs. 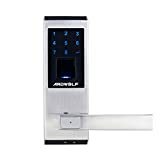 Loved for its consistent performance and sleek aesthetics, the Ardwolf A20 Keyless Biometric Door Lock is one of the best reviewed biometric locks on the market. Like most biometric locks, the Ardwolf A20 comes with a keypad and key lock as backup options. That being said, most users agree that the super-sensitive scanner works every time. The Ardwolf A20 is also one of the most affordable among fingerprint door locks. At only $150, this biometric system is pretty widely accessible. One negative point? This lock may be affected by moisture, so it’s best used for protected and interior doors. RFID is one of the older technologies among keyless entry systems and is also one of the most reliable. A wireless system that functions on old-school radio waves, a RFID setup includes a reader (your lock) and a tag: a key fob. These systems are super convenient. Typically you won’t need to take your fob out of your pocket or wallet in order to operate the system. Just being close enough or tapping the tag against the reader should be enough to get the lock open. This is super convenient when you’re carrying bags of groceries, unruly kids, or just don’t feel like digging around for your key. The disadvantage? Key fobs can be lost or stolen just as easily as regular keys. This makes them a little less secure and a little less convenient than a biometric system. 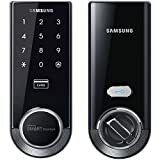 One of the sleekest looking keyless entry locks in any category, the Samsung Ezon SHS is a dual RFID-keypad system. Designed for outdoor use, the lock can take a little beating up, and won’t break down due to rain. The lock comes with a fob, but you can also easily buy compatible fobs on the internet in a range of styles, including ones that you can attach to your phone. The Ezon also includes a neat security feature: the ability to activate 2-factor unlocking. If you’re worried about keeping your home extra safe, you can turn this on so the lock requires both your RFID tag and your passcode. The HAIFUAN Digital Door Lock looks like the security feature that it is. It’s not very pretty, but it is an excellent option in home security. This lock comes with four entry options: your RFID tag, a remote control, a keypad code, and a manual key (in case you lose power or run out of battery). The HAIFUAN model is also set up with automatic locking, so you don’t have to worry about getting your keys out when you leave. All you need to do is pull the door closed. 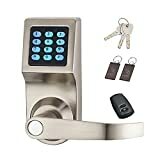 In short, it’s a great system at a very reasonable price and makes a good choice for keyless entry lock. Check out the reviews on Amazon for more details. For a reliable system that you can’t accidentally lose, look no further than the keypad. Another older piece of tech, keypads are widely used on garages and offices. They’re often overlooked, however, as a main entry system for the home. That being said, their convenience, ease of use, and ability to be easily shared by families makes them an excellent option in-home security. That being said, their convenience, ease of use, and ability to be easily shared by families makes them an excellent option for home security. Despite their advantages, keypads do come with a major downside. They can be hard to share with guests, contractors, extended family, or anyone you don’t want to have permanent access to your home. While fingerprints are easily deleted and fobs are given back at the end of their stay, changing the code means doing so for everyone. Switching your password even a few times can make it tough to remember. The Schlage FE595 is a good looking door handle, packing a whole lot of keyless safety. 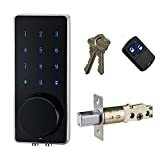 This model comes with dual entry options, both the keypad and the ability to use a manual lock should you forget your code or run out of juice. The flex-lock functionality means you can choose to have the door remain automatically locked or automatically unlocked. You can change your settings by turning a simple knob on the inside of the handle. When automatic re-locking is on, the door locks itself again five seconds after you enter the code. The HAIFUAN keypad lock is as elegant in appearance as it is in use. The easily installed lock features the ability to program different codes for guests or contractors. This kind of functionality is a major feature for keypad-style locks. This model is also rain proof, so it’s great for use outdoors. And if your battery dies, the HAIFUAN keypad lock comes with 2 emergency override keys. Most importantly? At only $79, this is one of the least expensive keyless locks money can buy. The most popular type of locking system for home use, Bluetooth keyless entry allows you to enter your house using only your smartphone. There is one downside to Bluetooth locks: if your phone is stolen, it can be used to enter your home. On the plus side, most of these locks come with easy override features to disable the connected smartphone or app. This means securing your home even if your phone goes missing is pretty simple. This small, sleek cylinder replaces the single-cylinder deadbolt you already have on your door. Designed to be operated by your smartphone (iOS or Android), the August Smart Lock works over a secure Bluetooth connection or your home’s wifi. This allows it to “talk” to your phone when it gets close enough to your door. The really cool part? You can give virtual keys to your kids, friends, family, contractors, etc., and set each to function differently. That is, your dog walker’s key can be set to only work between 4-8PM on Tuesdays and Thursdays, while your mom’s key can be programmed to function all the time. The lock also keeps a running tally of who’s coming in and out of the house, so you have a log of when your kids came home, how many hours your builder should really be billing you for, and whether your house sitter actually stopped by to water the plants. The Kwikset Kevo may look like a regular deadbolt lock, but don’t be fooled. This Bluetooth and RFID keyless entry system allows you to enter your home with just your smartphone. The Kevo is compatible with both iOS and Android and comes with the Kevo Mobile App, which allows you to check out the lock’s activity and manage who has access. The lock also works entirely on Bluetooth, meaning it’s not part of your home Internet network and can’t be hacked as such. Most importantly? The lock has an easy “lost phone” option so you can reset it if something should happen to your smartphone. 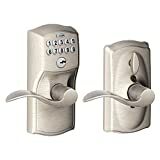 Which locking system is best for your home depends on your needs, tendencies, the number of people coming in and out, etc. For the responsible types who are good at keeping track of smartphones, Bluetooth is a great option with lots of customizability. If you’re looking for a simple, reliable security system for just a few users, the tried-and-true RFID and keypad options may be your best bet. And for those who would lose their own head if it weren’t screwed on, a biometric system might be the superior keyless entry lock for you. What do you look for in a keyless Entry System? Do you have a favourite brand? Are they easy to install yourself? Leave a comment below with all your tips and tricks about keyless entry door locks. Or, check out this article about our Best Home Safety Tips.